As we progress through Q1 of 2019, let’s look back on 2018 and analyze how funding in the transportation technology sector compares to previous years. The graphic below shows the total annual transportation technology funding amounts over time. To learn more about our complete transportation technology dynamic report, visit us at www.venturescanner.com or contact us at info@venturescanner.com. The transportation technology industry has seen $158B in total all time funding. 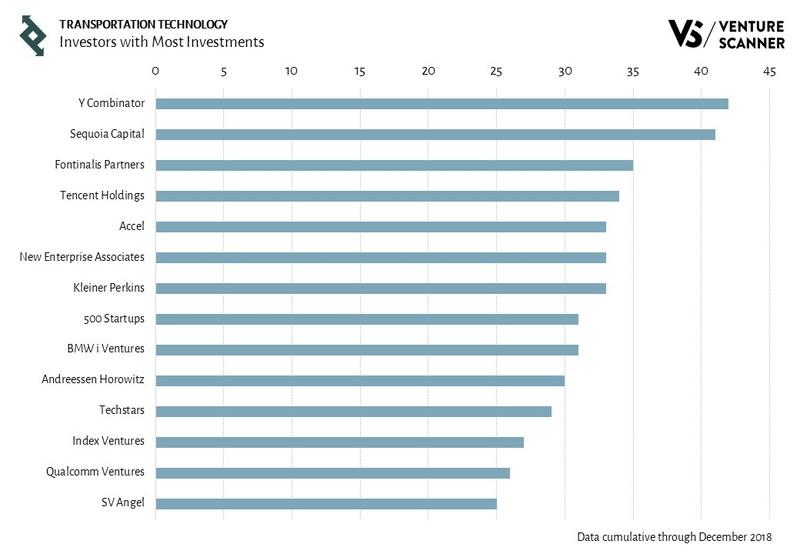 Let’s now examine the investors financing the transportation technology sector and identify the most active firms. Smart Mobility companies provide solutions for increasing sustainability in conducting transportation within cities. These solutions include all electric vehicles and distributed energy systems that recharge vehicles. Some example companies in this category include Gogoro, ChargePoint, Cityscoot, and Zagster. Let’s now see how the transportation tech categories’ funding compare with each other historically. 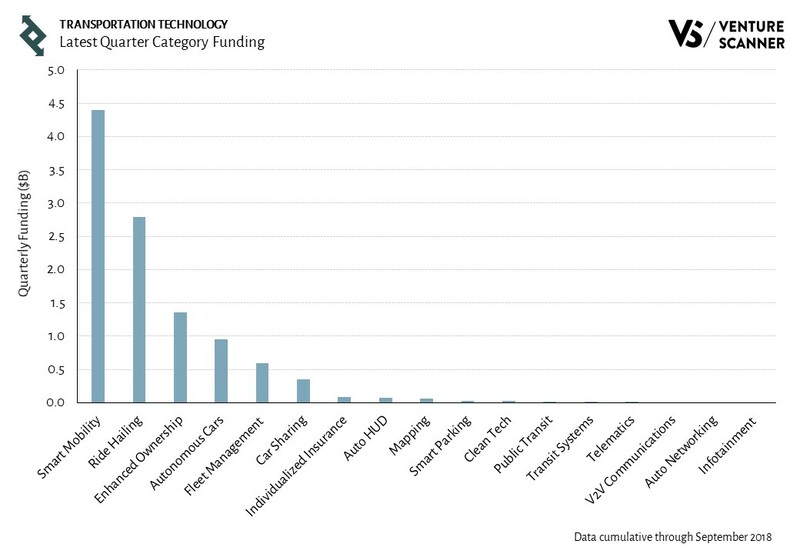 The graph below shows the all-time funding for the various transportation technology categories. The Q3 funding and growth rates of these categories are also highlighted. 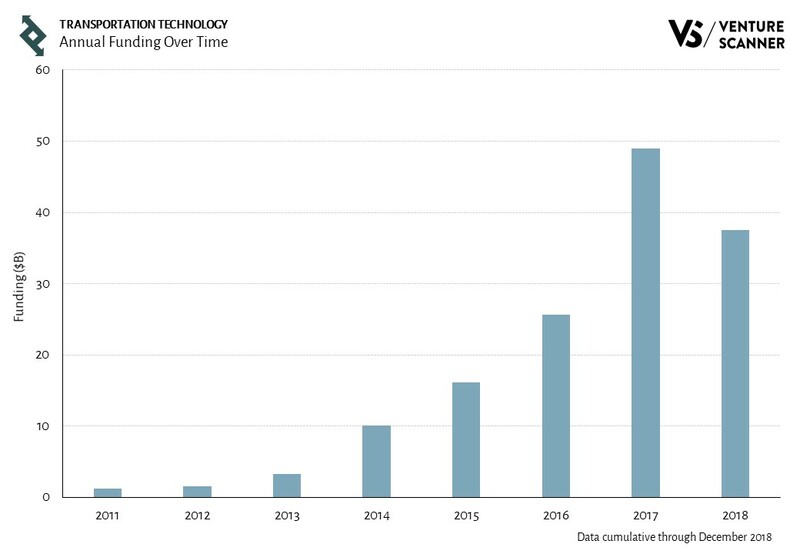 As the bar graph indicates, the Ride Hailing category leads transportation technology in total funding at $68B. Its funding is almost twice the funding of the next category, Smart Mobility at $37B. Ride Hailing companies enable consumers to schedule a ride either in real time or in the future. They include transportation network companies, white label mobile applications, and website booking portals. Some example companies in this category include Uber, Didi Chuxing, Lyft, and Ola Cabs. In summary, the Smart Mobility category leads transportation technology in Q3 funding, while the Ride Hailing category is the clear leader in total funding. To learn more about our complete transportation technology report and research platform, visit us at www.venturescanner.com or contact us at info@venturescanner.com. To learn more about our complete transportation technology report and research platform, visit us at www.venturescanner.com or contact info@venturescanner.com. Here is our Q2 2018 summary report on the transportation technology startup sector. The following report includes a sector overview and recent activity. We’ll explain these takeaways with some graphics and discussions below. 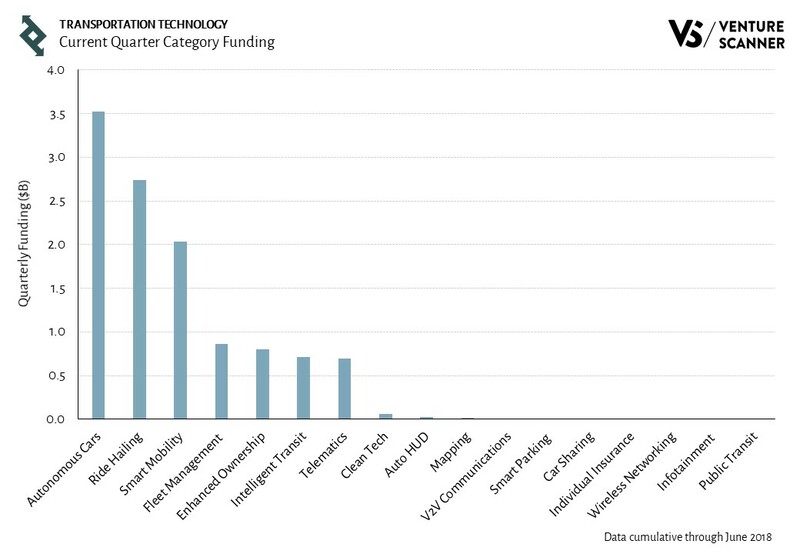 To start off, let’s look at transportation technology category funding in Q2. 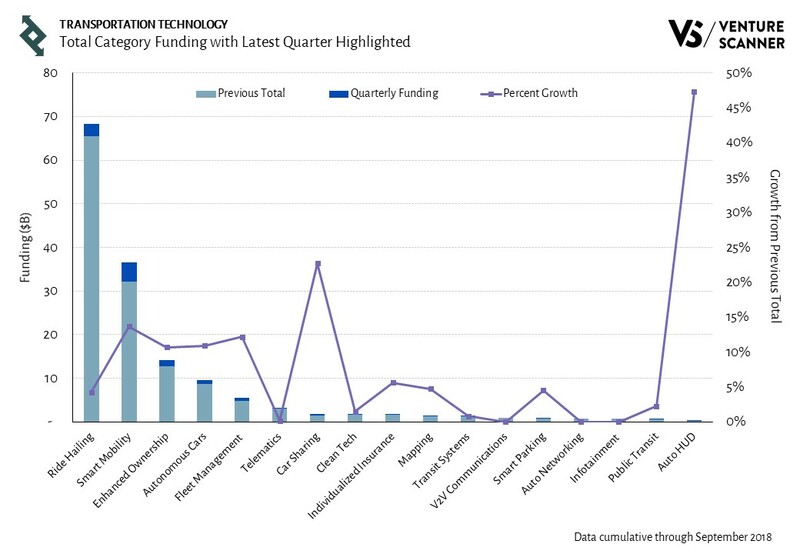 The above graphic shows that the Autonomous Cars category leads the sector in Q2 funding with $3.5B. The Ride Hailing and Smart Mobility categories follow in the second and third places with $2.7B and $2B, respectively. So we’ve witnessed how different transportation technology categories stack up in their Q2 funding. But how do these categories’ funding compare with each other historically? Let’s investigate that in the next section. 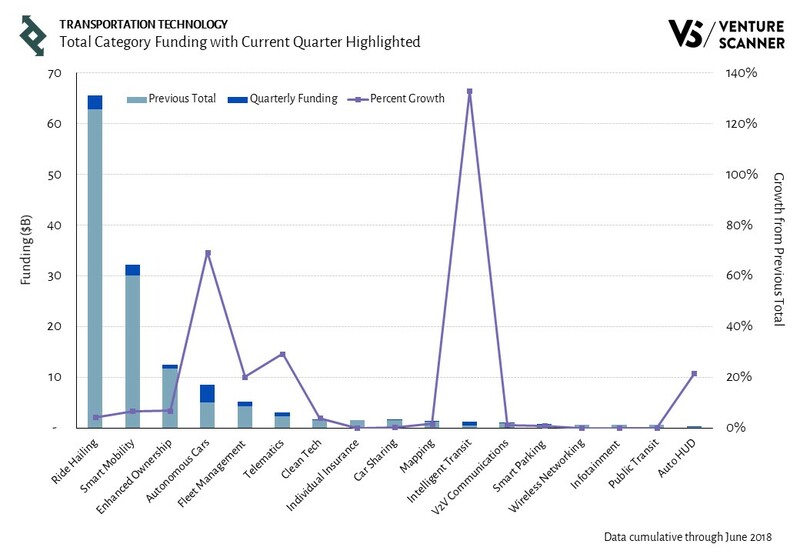 The graph below shows the all-time funding in different transportation technology categories. The quarterly funding and growth rates of these categories are also highlighted. The bar graph in the above graphic indicates that Ride Hailing absolutely dominates the sector in all-time funding with $66B. Its funding is more than twice the funding in the next category, Smart Mobility. The line graph demonstrates that Intelligent Transit had the highest growth rate in Q2, more than doubling its funding. In summary, we have analyzed the transportation technology funding amounts in different categories. We’ve discovered that Autonomous Cars leads the sector in Q2 funding, while Ride Hailing dominates in all-time funding. It’ll be interesting to see if any other transportation technology categories will catch up in the rest of 2018.